Harvard-Westlake's Sydney Tsutsui wheeled off court after injury. GLENDALE.–It’s not often to see an overt display of frustration from a player whose team is winning by 20 points. 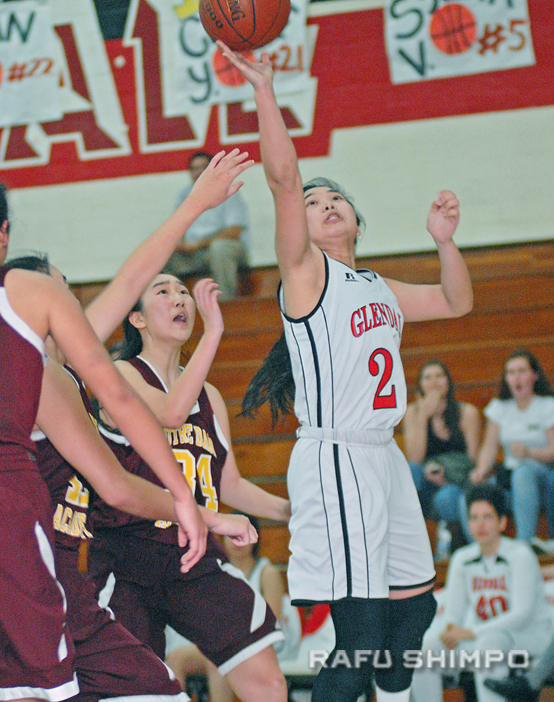 The agitation was evident when Glendale High junior Jillian Yanai was called for a foul after turning over the ball by dribbling off her own foot. “I take the game seriously, and I try to value every play,” explained Yanai, after her Nitros ran away with their CIF Southern Section Div. 2A second round playoff game on Saturday, a 53-32 win over visiting Notre Dame Academy. “This is the playoffs, and plays like that are just not acceptable. If we’re going to get through the next round, we have to play better than that,” said Yanai, who finished with 11 points. She also had three steals and and five assists, three of which went to her sister, senior forward Claire Yanai. The elder Yanai tied for the team lead with 14 points. Junior guard Jillian Yanai finished with 11 points and five assists. The game was a blowout almost from the start, with Glendale launching a 10-2 run before the seats were warm. Notre Dame tried to fashion together a rally in the third, but the Nitros would not relent, forcing the Gryphons into committing 16 turnovers. Dannielle Orteza scored a game-high 18 points for Notre Dame Academy, while frosh teammate Jackie Oldoerp added two off the bench. Glendale advances to face Aliso Niguel, who eliminated South Pasadena, 70-47. The game is Wednesday at a location to be determined. Hope Kakihara‘s five points helped Troy to a 57-50 victory at Alemany. The Warriors host Sierra Canyon on Wednesday. Harvard-Westlake’s Sydney Tsutsui had to leave the court in a wheelchair after a leg injury, but her team pulled out a thrilling 59-58 victory over powerhouse Mater Dei. Harvard-Westlake hosts Lakeside on Wednesday. Chaminade’s Mackenzy Iwahashi scored 15 points, but Sierra Canyon was in control throughout, 79-47. Chaminade will take on Alemany in the consolation bracket of the Open Division on Tuesday. Ally Yamada scored five, but Fairmont Prep fell to Serra, 68-48. Allie Navarette scored 29 points and Halle Maeda added 21 as host Mira Costa advanced with a 73-53 victory over Valley View. The Mustangs will face MLK of Riverside on Wednesday. Kaylyn Nakaji had seven points and Huntington Beach advanced with a 65-41 win over Summit. HB will host Duarte on Wednesday. Lauren Tsuneishi scored nine points with five steals, and Redondo Union won handily against Centennial of Corona, 61-24. Redondo travels to St. Anthony in the next round. Mark Keppel’s girls saw their season end with a 60-49 loss to St. Anthony. West Torrance was ousted in a 61-46 loss to visiting Valencia. 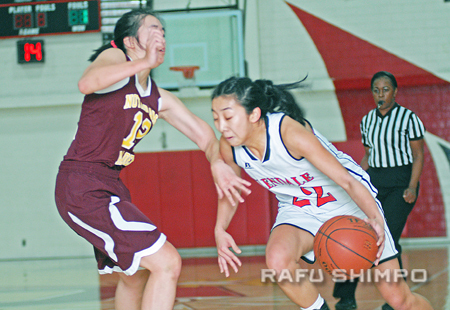 Torrance got 14 from Jordan Sakasegawa and five from Kacie Yonemoto, but the Tartars fell at Righetti, 61-36. Jenna Pitpit, Reanna Mayo and Walnut advanced to the quarterfinals with a 65-48 triumph over Temescal Canyon. Renae Tamura scored a game-high 21 points and Taylor Yoshida had 15, in Flintridge Prep’s 55-32 home win over Granite Hills. The Rebels ended the night with a 13-0 run in the fourth period. Prep will host Oxnard in Wednesday’s quarterfinals. Palos Verdes, with Mari Shigekawa, took care of Rialto, 59-34, and will host Thousand Oaks on Wednesday. TO edged Cerritos, 44-42, to advance. Erin Koyamatsu netted 13 and Charissa Rikimaru added three in Crean Lutheran’s 71-52 home victory over Rubidoux. Crean Lutheran will host University Prep on Wednesday. Maddy Yamada netted 12 points for Rolling Hills Prep, who downed La Sierra Academy, 82-15, and will host Lucerne Valley on Wednesday.